The ANB team presented our President and CEO, Ginger Martin, with a banner commemorating her successful completion of The Freedom Climb 2014. Ginger climbed to the summit of seven mountains in Colorado over 14,000 feet in elevation in four days. The Freedom Climb objective is to stir compassion, action, and advocacy on the issues of modern day slavery, exploitation and trafficking of women and children globally. To learn more about The Freedom Climb go to http://www.thefreedomclimb.net. 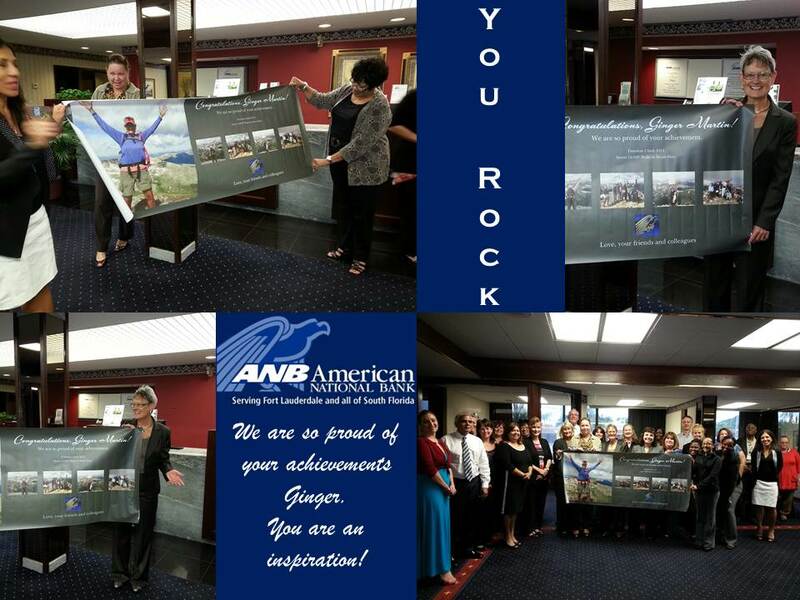 The ANB team honors Ginger Martin with a collage for her successful completion of The Freedom Climb 2014. This entry was posted on Wednesday, July 23rd, 2014 at 1:10 pm and is filed under Uncategorized. You can follow any responses to this entry through the RSS 2.0 feed. You can leave a response, or trackback from your own site.